It takes a special person to be a hospice volunteer. Hospices provide a caring, uplifting environment for terminally ill patients. The experience of being in a hospice offers comfort and a gentle environment where the patient and their family can share the best possible quality of life at a very difficult time. Hospice volunteers help in many different capacities from spending time with patients to offering beauty therapies and helping out on reception. Hospices provide welcoming, caring support for patients with terminal illnesses. Patients may stay in the hospice or visit it during the day for various activities. They are usually person-centred in their approach and exist to promote wellbeing, dignity and the best possible quality of life. They aim to make life as normal as possible for patients and their families. They are often charities with limited resources. Volunteers can make all the difference and an estimated 100,000 people volunteer in over 200 hospices across the UK. Anyone who feels they would like to can offer their service. No particular qualifications are required; there are lots of roles available. You will need empathy, maturity and an ability to listen. Volunteers need to be calm, positive and reliable. Some people may want to give something back if a friend or relative has stayed in a hospice or may be interested in a career in health, counselling or social care. People may want to share their practical skills such as hairdressing and some employers will even give time off to employees who want to volunteer. Some hospices have arrangements with local schools that help out with fundraising and sometimes older pupils can volunteer in the hospice. Time commitments vary with the roles but everyone will need a police Criminal Records Bureau/Disclosure Scotland background check. Volunteering provides an opportunity to make new friends, give something back to the community and to develop life skills and experience. Whatever role you volunteer for induction and training will usually be given. You will work alongside hospice staff who will provide ongoing support. A key role is receptionist, greeting visitors and answering phone calls. In many hospices Reception is staffed solely by volunteers at certain times, especially evenings. Offer to share your practical skills such as hairdressing, manicuring and beauty therapy. Complementary therapists are always welcome so that patients can benefit from massage, Reiki or acupuncture. Get involved as a flower arranger or use your gardening skills. Hospices often have landscaped gardens where patients can enjoy peace and tranquillity. Help with planting, weeding and general maintenance ensures the upkeep of these oases. For some people working on the wards is the reason to volunteer. Provide practical help by running messages for the nurses, making beds and serving meals or spend time chatting to the patients. Support the occupational therapists and assist with games or arts and craft classes. One of the most demanding roles comes with providing bereavement support for relatives and usually this will require some training unless you already have a counselling qualification. Drivers provide a useful service in collecting patients for day hospice visits and in transporting relatives. Those with appropriate experience can also volunteer as mini-bus drivers which take patients out on day trips. Work in the patient library or assist in the coffee shop. Be a refreshment volunteer making tea and sandwiches, working in the kitchens and serving. Other vital roles include administration support - helping with office work such as photocopying, filing and paperwork. Help with the laundry or bring along your DIY skills or trade and help with building maintenance such as painting, decorating and plumbing. Other key tasks include fundraising and organising events both for the patients and for supporters. Hospices may have several hundred volunteers and coordinating them may also be a job for a volunteer. Finally many hospices have shops on their premises as well as fundraising shops located elsewhere in the locality. Volunteer shop assistants receive and sort donations, display items in the hospice shop and serve customers. Contact your local hospice to find out more or visit the 'helpthehospices' website for further details. 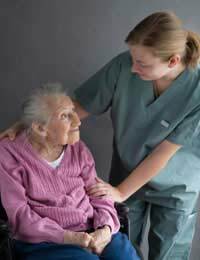 What is the Role of a Support Worker?